The origins of Sticky Toffee Pudding are distinctly British. Some say it's an old recipe from the South of England, although inhabitants of Eastern Scotland also lay claim to its invention. Whatever the case, it appears to have been developed in a hotel kitchen, which may account for the fact that it continues to appear on restaurant menus with some regularity, likely based in part on its ease of preparation. Also note that this is not a pudding in American terms. In Britain, "puddings" are steamed cakes. 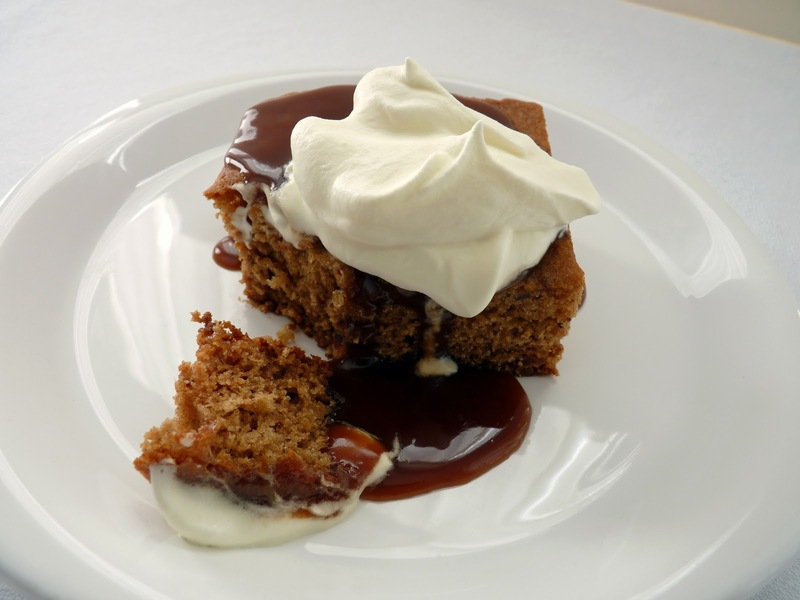 In America, Sticky Toffee Pudding is a baked cake served with toffee sauce, which is where the sticky part comes in. Are you with me? This cake is fairly light with a very nice soft crumb. The toffee sauce is really terrific - rich and dark without overwhelming everything. I think the lemon juice saves it from being too cloying. The sauce really makes the whole dessert so don't even consider leaving it out! And I've added a dollop of whipped cream here but vanilla ice cream would of course be superb. - I highly recommend using Medjool dates because they are gorgeously plump and have a sort of natural toffee flavor all their own. - When you add the baking soda to the hot beer, the mixture will foam up. - Don't be alarmed when you see that there isn't much cake batter. It rises generously. - I made 1/2 the cake recipe in an 8" x 8" dish. If you double the recipe for the cake, you'll need a 9" x 13" pan. Use a total of 3 eggs. - In the original recipe, Beranbaum sets the temperature at 350 degrees but cautions if you use a Pyrex dish or dark pan, then it should be lowered to 300 degrees. However, I baked mine in a Pyrex dish at 325 degrees and that worked fine. - I made 1/4 of the toffee sauce recipe, which I thought was plenty for 1/2 of the cake recipe. If you increase the toffee sauce, you'll likely have some left over, which would be crazy terrific spooned over ice cream. - I cooked the toffee sauce for 2 minutes on low heat to make sure the sugar was dissolved and to develop a bit of color. 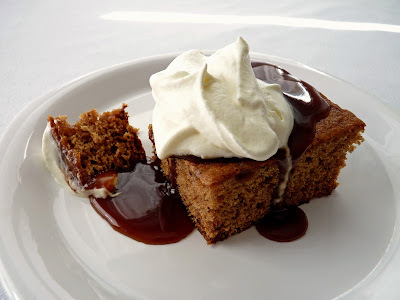 Note: The recipe below is for half the original cake recipe and one-fourth of the toffee sauce. You can find the full version of this recipe here. Preheat oven to 325 degrees. Grease an 8" x 8" Pyrex baking dish and line the bottom with parchment, leaving an overhang on two sides. Cut open the dates and remove the pit and stem. Coarsely chop and place in a bowl. Bring the Guinness to a boil. Remove from heat and whisk in the baking soda. Pour this over the dates and set aside to cool. Then place the dates in a food processor with a little of the beer mixture. Process until a paste is formed, gradually adding the remaining beer mixture through the feed tube. Scrape into a bowl and set aside. Sift together the flour, baking powder, salt, cinnamon and nutmeg. Beat the butter, sugar and vanilla on medium speed until light and fluffy, about 4 minutes. Whisk the egg and egg yolk and gradually add in three additions, scraping down the sides and bottom of the bowl as you go. Add a third of the flour mixture, alternating with half the date mixture and beginning and ending with the flour. Mix just until the batter is uniform in color without any streaks. Scrape the cake batter into the prepared pan and spread out the evenly. Bake for 25 - 30 minutes or until a tester comes out clean. Cool for 10 minutes in the pan on a wire rack. Then gently lift the cake out of the pan using the parchment overhang to assist. Remove the parchment. For the whipped cream, whisk the cream, sugar and vanilla just until it holds a very soft peak. 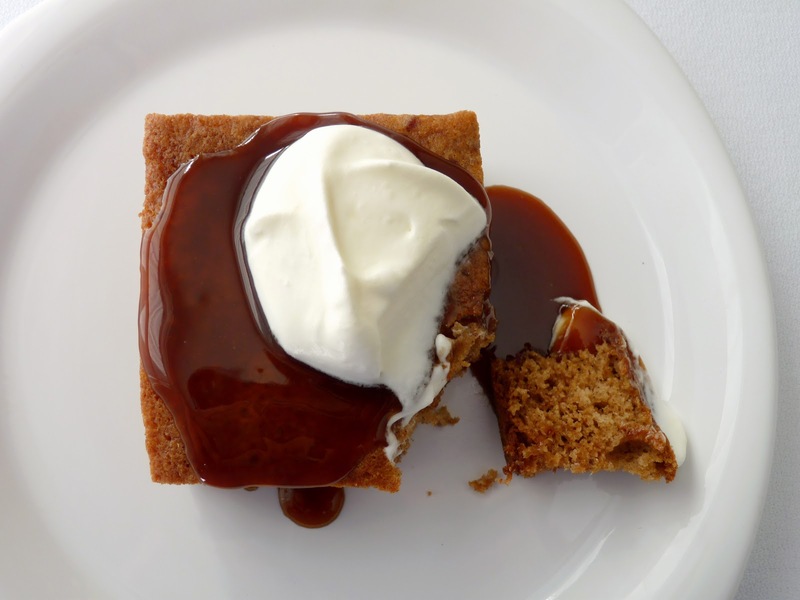 Place a slice of cake on a plate and spoon the toffee sauce over the top. Garnish with a dollop of whipped cream. It's time to have some fun with sandwich cookies. I love making cookies of all kinds - crispy, crunchy, soft, chewy, sandy, nutty, spicy; piped, cut, rolled or dropped. What makes pastry so much fun is the delicious variety of all these shapes, sizes, tastes and textures. Sandwich cookies are a bit more fancy just by virtue of their filling but they aren't really a whole lot more work, especially when you keep the ingredients simple. 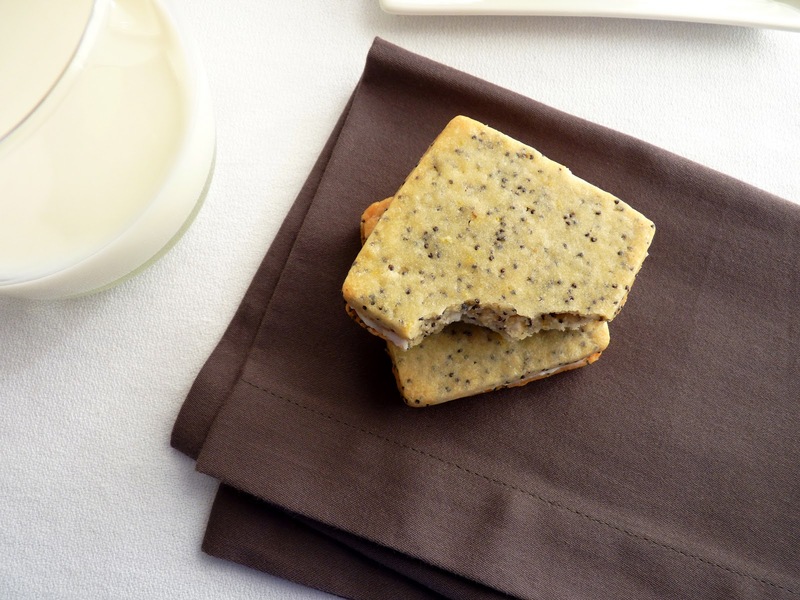 Poppy seeds are an ancient ingredient widely used in Eastern European pastries. 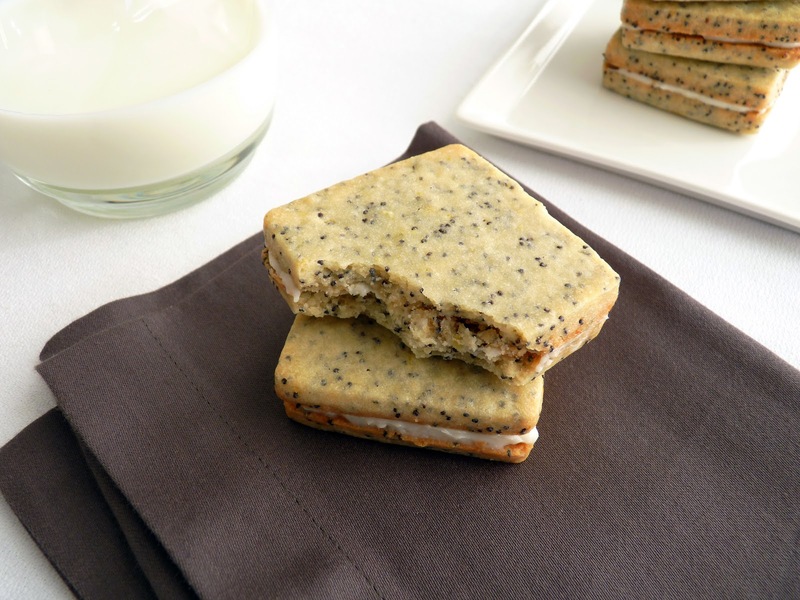 I've used them here to make poppy seed cookies with a hint of lemon. The filling is a nice gooey cream cheese frosting that also has a spritz of lemon to keep it bright and not overly sweet. If you prefer a simple shortbread, these cookies are also perfectly good plain. And since they're made in a food processor, they take very little effort. 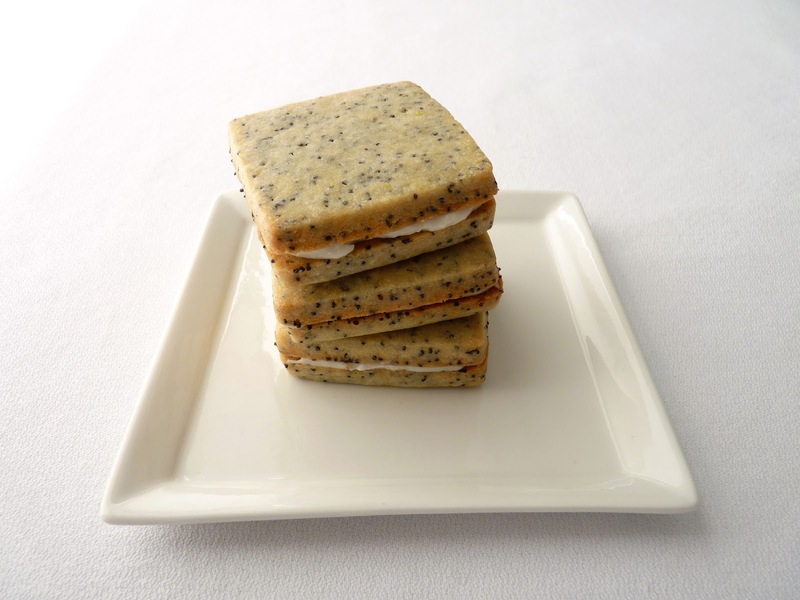 - For an inexpensive alternative, I buy poppy seeds at World Market. - These would also taste great filled with some raspberry or blueberry jam. - Cookies soften a bit when filled so if you'd like to keep them crisp, fill them just before you're ready to serve. Cookies will keep in an airtight container; the filling will keep in the refrigerator. - If you love poppy seeds, try this tender Poppy Seed Cake with Mascarpone Cream. Place the flour, confectioner's sugar, poppy seeds, salt and lemon zest into the bowl of a food processor and process to combine. Cut the cold butter into 1/2" cubes and add to the flour mixture. Process 10 - 15 seconds. Combine the egg and vanilla and pour over the mixture. Process about 15 seconds until the dough starts to clump around the center of the machine. Gather the dough and divide in half. Place half of the dough on a piece of plastic wrap. Cover with another piece of plastic wrap and roll out to a circle 9 1/4" in diameter. Slide onto a sheet pan and refrigerate until completely chilled. Repeat with the other half of the cookie dough. When the cookie dough has been thoroughly chilled, preheat oven to 350 degrees. Line 2 baking sheets with parchment or silpats. Remove one sheet of cookie dough from the refrigerator and lift off the plastic wrap on both sides. Using a 2" round or square cookie cutter or other similar sized shape, cut out cookies and place on prepared cookie sheet. Refrigerate. Repeat with second sheet of cookie dough. When oven is ready, bake the cookies until the edges just start to take on some color, about 12 minutes, rotating the baking sheets halfway through. Cool on a wire rack. For the filling, whisk together all of the ingredients until smooth. Spread onto half of the cookies and top with remaining cookies. Like you, I've got lots of stacks of recipes to try and hundreds of online bookmarks of pastries and desserts that I keep meaning to move to the line-up for more careful consideration. This is one of the "someday I must try this" recipes that I'm really happy to pass along because it's an amazing fruit composition that has all the elements of a perfect winter dessert. My go-to fresh fruits this time of the year are apples, pears and citrus. 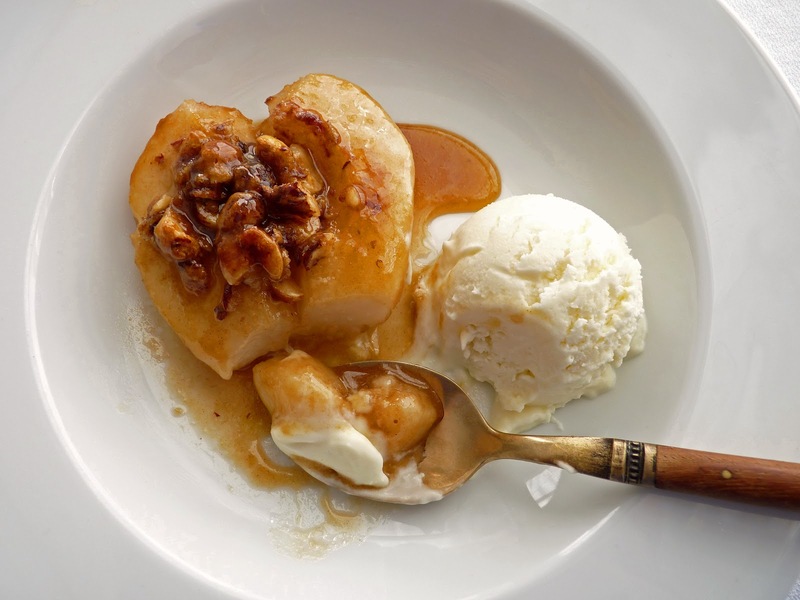 Today's very sumptuous dessert recipe features roasted pears with a terrific sauce. I'd say it's definitely one for your recipe files to use whenever you have some fresh pears and about 10 - 15 minutes to get the whole thing together. 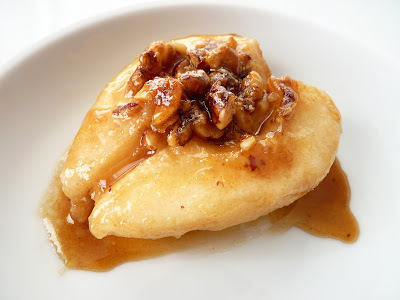 The pears are peeled, cored and stuffed with a brown sugar and hazelnut mixture fortified with just a little nip of booze and butter. Some apple juice is added to the roasting pan and maple syrup is drizzled on top of the stuffed pears. As they bake to peak perfection, the butter and brown sugar melt and intermingle with the apple juice, maple syrup and Frangelico and transform into a swoon-worthy caramel. This makes for a super delicious baste for the pears and a luscious sauce when served. I love the hazelnut vibe in this recipe but if you're not a fan of hazelnuts, substitute almonds or pecans and use Amaretto, brandy or rum. In this instance, I think you must serve the pears with vanilla ice cream for an extra moment of sublime luxury, any given day of the week. And really - I must honestly say, I hope you survive all this crazy goodness. - I used D'Anjou pears. - I added a pinch of cinnamon and salt to the filling, which I think made a really wonderful difference. - My pears were fairly ripe and baked in half the time, 20 minutes. So depending on your fruit, I would advise to test for doneness as you baste. - I served this dessert with some Goat Cheese Ice Cream from Jeni's Splendid Ice Creams at Home by Jeni Britton Bauer, which was hideously magnificent. - The roasted pears would also be good to serve alongside a cheese plate. Coarsely chop nuts into bite-sized pieces. Place in a bowl with the brown sugar and flour and toss. Add a good pinch of cinnamon and a light sprinkle of salt, if using. Break the butter into small pieces and work it in with your fingers until roughly combined along with the liqueur. Peel, halve and core each pear, making a nice well for the stuffing. Arrange them cut side up in a 11" x 7" glass baking dish. Mound the nut mixture into each of the pear cavities, pressing to compact the filling. Pour the apple juice into the dish. 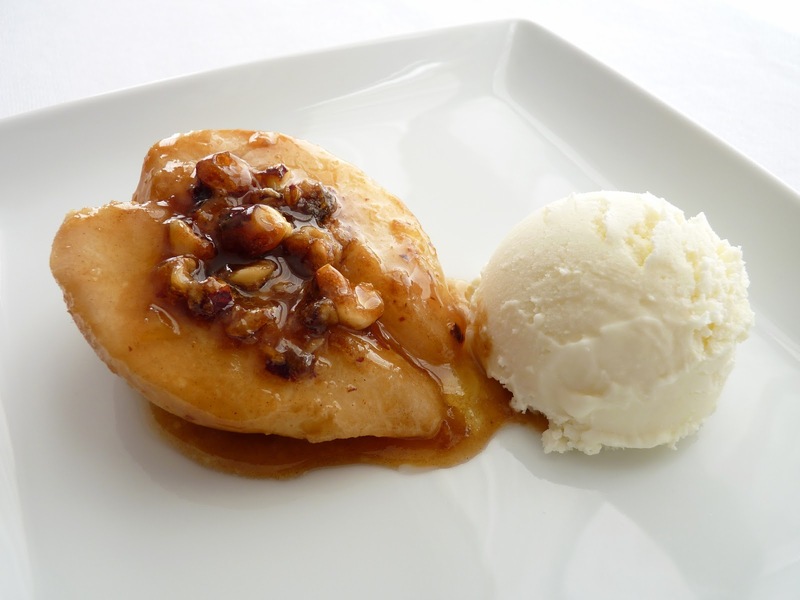 Drizzle each pear with 1 tablespoon of maple syrup. Roast the pears until tender, about 45 minutes, basting occasionally with the juices. Pears should give easily when pierced with a sharp knife. Transfer pears to plates and drizzle with the juices. Serve warm with a scoop of vanilla ice cream. It's early in the morning and the aroma of fresh coffee wafting through the house makes you realize you'd like a nice little something to go with that first luscious cup of hot java. Maybe you have some new coffee beans you've ground and you're excited about a new brew. Or maybe you'd just like something to take the edge off an early rise. Something that is so easy there can be no resistance to the idea of making them on a whim as you greet the coming of a new day. 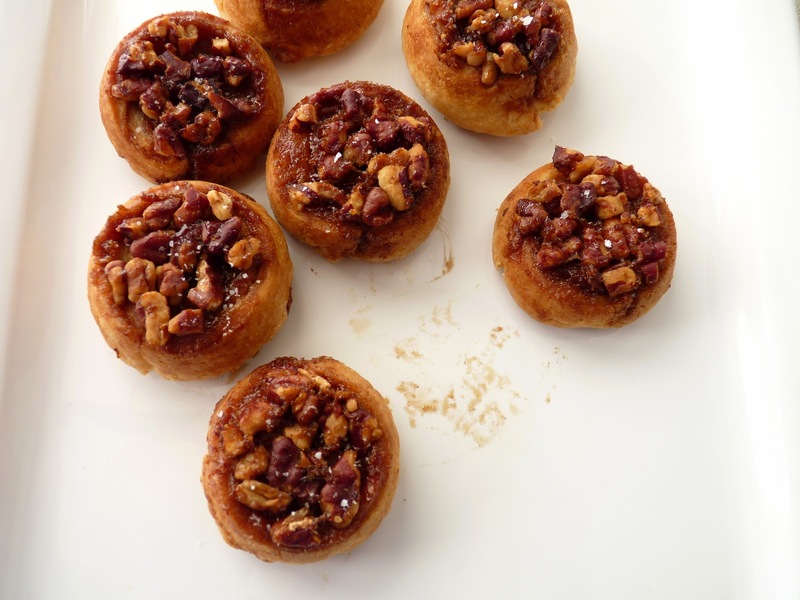 There's something about pecans and sticky buttery brown sugar concoctions that make just about everyone sit up and take notice. The smell of cinnamon and gooey sugar gets all our neurons firing. These little two-bite pastries capture a lot of that flavor and chewy goodness with very little effort on any given day of the week. Instead of a yeast dough or pie dough, this is a very quick preparation similar to cream scones. Once you slather the rectangle of dough with butter, a sprinkle of salt, cinnamon and brown sugar, you roll it up and refrigerate it so it firms up enough to slice easily. 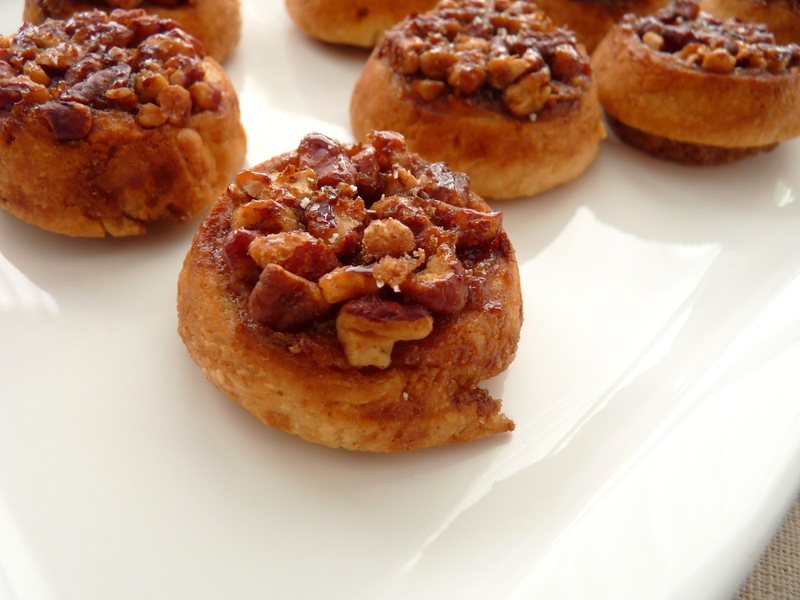 Bake them and in just 12 - 15 minutes you suddenly have a snack plate full of delicious pastries that would also be great for a brunch or as a bite-sized sweet on a party tray. 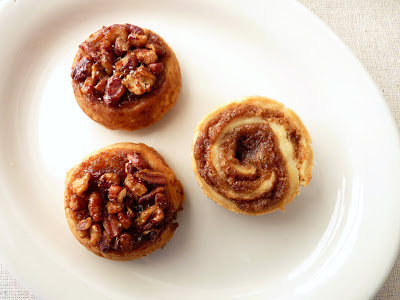 And while these obviously don't have the richness of full-blown cinnamon rolls or sticky buns, their lightness and modesty provide their own sort of benefit. This enticing little bite with that freshly brewed cup of coffee will no doubt send you happily on your way. - The recipe calls for pecan halves placed in the muffin wells but I chopped them coarsely for a different look and bite. - I added some orange zest on top of the brown sugar layer before rolling up the dough. I'd probably also add a pinch more cinnamon the next time or maybe a dot of allspice because I'm a slave to spices. - To portion the pieces equally, the easiest thing to do is to cut the roll of dough in half, then cut each portion in half, then cut each portion into 6 pieces. - You really do want to release the pastries from the pan straight out of the oven or the sugar hardens on the bottom and they will stick. Just flip the pan over and they pop right out. - I forgot to sprinkle the salt on top of the butter so I sprinkled the pastries after I baked them and turned them out. In any case, salt really does add to the deliciousness so be sure to use it. Grease a mini-muffin pan or pans with butter. 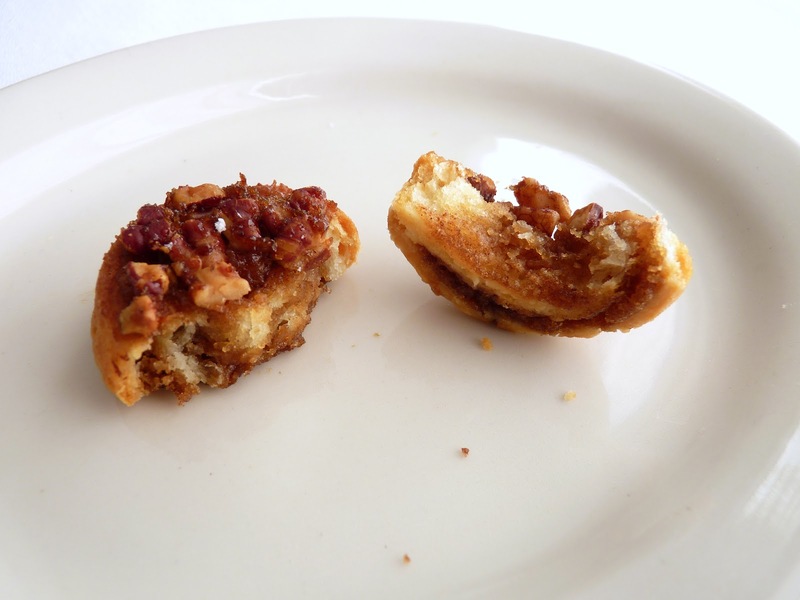 Place a pecan half in each muffin cup, top side down. Whisk the flour, baking powder and salt together. Make a well in the center and pour the cream into the well. Stir together just until the dry ingredients are completely moistened and a soft dough forms. The dough won't look perfectly smooth. Set aside to let it rest for 2 - 3 minutes so the flour absorbs all the cream. Place the dough on a lightly floured piece of parchment or a work surface. Roll the dough out to a rectangle about 12" x 7" and 1/4" thick, lightly dusting with flour as necessary. Using a small offset spatula or your fingertips, spread the dough with the soft butter. Sprinkle with a pinch of salt. Sprinkle the brown sugar and cinnamon, leaving a 1/4" border. Starting at one of the shorter ends, roll the dough up tightly and press the seam to seal. Place the roll seam side down and gently stretch it to lengthen it slightly to about 12". Refrigerate for at least 30 minutes. Cut the roll of dough crosswise into 24 equal pieces. Place each piece in a muffin cup, cut side up. Bake until browned, 12 - 15 minutes, rotating the pan(s) from front to back halfway through the baking time to ensure even baking. Immediately turn the pastries out onto a sheet of parchment on a heatproof surface. Serve warm.